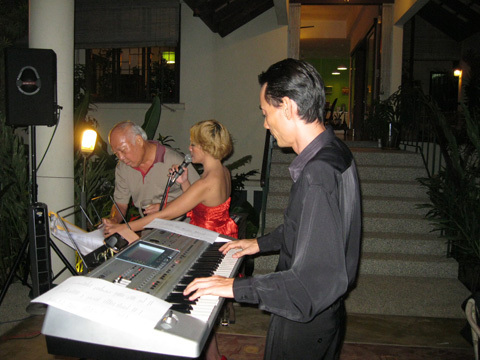 Jason Geh’s 3 piece Jazz Band performed for a private birthday party at a bungalow residence off Jalan Gasing, Petaling Jaya on the 22nd of December 2012. The jazz group consists of a saxophonist, female singer and Jason on keyboard. This band line up is sufficient outfit for most events as live band entertainment; however the inclusion of a guitarist and percussionist will be feasible. The party was situated by the poolside with canopies established as it is raining season here in PJ. But it was fortunate for everyone that the weather was cool and clear. Jason’s band performed during dinner with easy listening music at the start, with livelier repertoires at the latter half. There was some crowd participation towards the end with 2 members of the guest coming up on stage to sing songs with the band aka Karaoke time. Below are the songs featured on the video above. These songs were requested by the organizers. There were positive feedback from everyone during and after the event. If you like this post, like it, leave a comment or share it with your friends.